The Kotaba Sector is a sector of space in the Delta Quadrant of the Milky Way Galaxy. The region is highly contested between multiple governments including the Benthans, Hirogen, Kobali, Malon, the Supremacy, and the United Federation of Planets. Galaxy Class Federation flagship currently assigned to oversee Starfleet operations in the region. Sentinel Class Federation Starfleet vessel under construction at Platform Station. The Noonien Soong is the lead engineering vessel assigned to this sector. Dauntless Class Federation Starfleet vessel under construction at Platform Station. A near ancient array of communications satellites used by the Hirogen to coordinate the hunting of prey. A Starfleet outpost containing the experimental wormhole generator. Residing on the colony world of New Talax, the Talaxians are a humanoid species native to the Delta Quadrant. This race is well known for their storytelling, friendly attitude, and love of food. They are the first Delta Quadrant species to join the Federation. A system previously home to 2 planets, the Al'Yans System features a Hirogen Communications Station in the system alongside the remains of the 2 destroyed worlds. A system of 2 planets and an expansive asteroid field, the Entaba System is the site of a Talaxian Mining Colony. A system with a single gas giant surrounded by 12 moons, the nomadic Kobali established a homeworld on an M-Class moon orbiting the system's gas giant. A system containing only its star, the Nanipia System is a frequent dumping ground for the Malon. 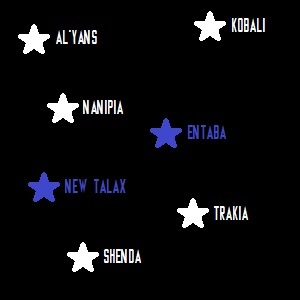 A system of 5 planets, the New Talax colony has been established in this system. A system of only 1 planet, the star Shenda is in its final stages of life and is preparing to collapse in upon itself. A binary system of 6 planets and 30 moons, the Trakia System is home to a Hirogen Communications Station.